And then there's the buoyant optimism that lifts the heart beat of everything Reid does. His songs portray everyone's biography and celebrate life's essentials – love, family and friendship foremost. But, Reid is always mindful of the little treasures that we all shamefully overlook. His uncanny knack for making each member of his audience feel special has mustered a “Tartan Army” of fans with a PhD in loyalty. ”It's about writing songs that help people,” he declares. “Songs that help them cry when they need to and help them laugh when they can.” There, it all makes perfect sense. 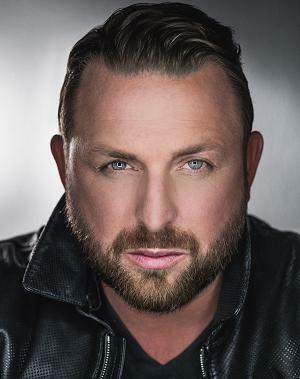 For Johnny Reid, content and feel-good entertainment trump category! Born in Lanark, Scotland, Reid was 14 when he moved to Canada in 1988 after his father, a diesel mechanic, accepted a job in Brampton, Ontario. “I had to go through the new guy thing,” says Reid who plumbed unfathomed strengths within himself, the ability to sing and athletics, to make the awkward transition. The latter earned him a scholarship as a kicker on the varsity football team at Bishop's University in Lennoxville, Quebec, where he met his wife Jenn. After graduation, Reid packed up his young family and settled in Nashville, Tennessee as a song writer. When that prospect shrivelled, he worked where he could while circulating demos of his compositions. Enquiries about the tunes and the unique voice that sang them brought encouraging if modest success with his debut CD, Another Day, Another Dime (1997) and a self-titled effort in 2000. Johnny Reid really hit his stride in 2005 with Born to Roll, the first pearl in a string of platinum-selling releases, charting hits and 3 Juno Awards that glittered through Kicking Stones (2007), Dance with Me (2009) and A Place Called Love (2010). Two Christmas CDs and two live DVDs deserve honourable mention. “You know, life is very short. I think we're reminded of this every day,” he says of the theme behind his latest CD Fire It Up (2012), which received a Juno Award nomination for Adult Contemporary Album of the Year. Reid and Toronto playwright Matt Murray are currently developing My Bonnie Lass, a compelling musical tribute to his grandmother, Maggie and his family in Scotland.